Wilderness First Responder certification is quickly becoming the minimum certification standard required for professional guides, outfitters or anyone else who may be called upon to render lifesaving medical treatment to people far from definitive medical care. Police, Military, Firefighters, Conservation field workers, Search and Rescue and other outdoor professions can benefit from the information provided in this course. Join us for a 5-day, 4-night Joshua Tree National Park camping trip May 6th- May 10th, 2019. This unique getaway will allow you to relax under the stars and let loose under the sun. Activities include daily hikes, a rejuvenating private sound bath at the Integratron, rock climbing, night sky presentation, yoga, Falconry, and ATV-adventure tour. Price includes all catered meals and camping/climbing equipment. $1288/person. 14 person max. Please fill out the form below so we may contact you with more details about the trip. Enjoy an exclusively private custom hike with your very own nature guide. Your guide will lead you on a mostly off-trail adventure through the Joshua Tree wilderness. Towering rock formations, canyons, sweeping vistas and surreal landscapes from another planet await you around every bend. All along the way, your expert guide will share the history and geology of the Park, along with a myriad of stories and talks about the plants, animals and other unique characteristics of the Park. 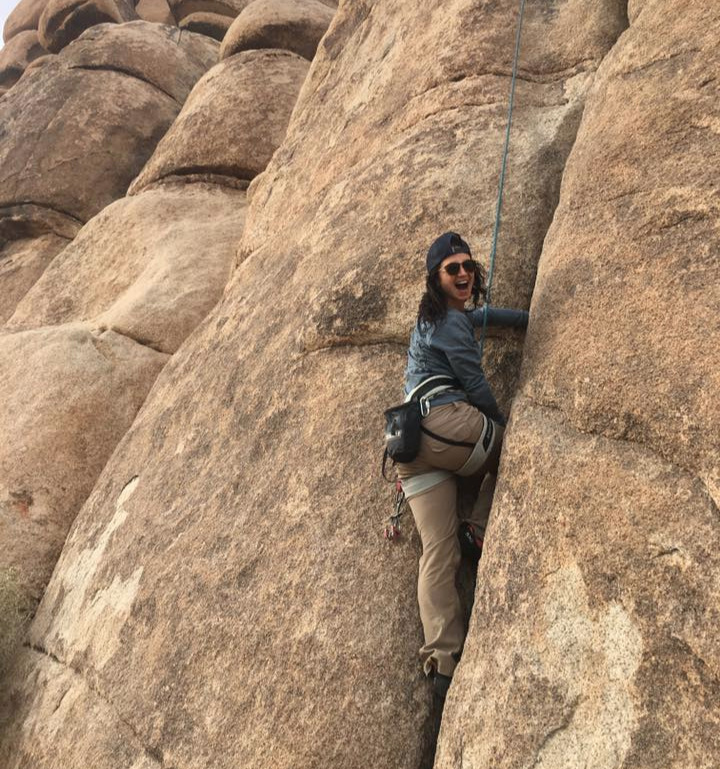 Experience Joshua Tree’s rock formations up close with a private rock climb. Your certified rock guide will provide you with all the necessary equipment & instructions for a perfect day on the rocks. Whether you are a first time climber or multi-pitch expert, our guides will make sure you have an incredible experience. Enjoy an evening exploring the cosmos with a private astronomer, all while enjoying a delicious meal cooked by your guide. Your personal astronomer for the evening will allow you the opportunity to get an up-close look at the night sky through a high-powered telescope. Looking for a unique, exciting and interesting way to spend your next corporate team building event? Turn to us for all your outdoor event needs: team building, scavenger hunts, hiking, climbing, camping or just an incredible customized outdoor experience. We will build an event around your company's specific needs, interests and desires. Stay up-to-date with our latest events by connecting with us on social media.